Research Collective Blog - Build It! Many automotive and med-tech manufacturers today design devices that require users to interact with touchscreens. 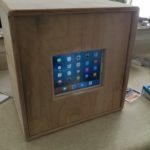 Often, these touchscreens range from just a few inches wide to potentially several feet wide. 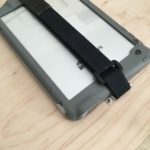 As a result, there is a significant need for the UX community to have a stable, workable platform to “house” prototyping tablets and other touch sensitive screens while conducting research on early, low-fidelity prototypes. There are a few solutions out there right now. Expensive and cheap ones. However, for your average UX professional, the expensive options don’t make a lot of sense, financially speaking. And the cheap options are, well, cheap. They tip over. They’re flimsy. They don’t have enough weight. Participants interact with them, and the thing moves around the table. This picture-rich blog post shows the steps I took to build a solution that worked for our needs. 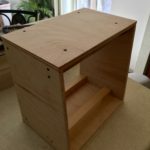 The prototyping box I designed can be made for about $50 – $75, assuming you (your neighbors, father-in-law) already have access to a few woodworking tools. Additionally, it’s a relatively easy and quick build that should take you about 4 – 8 hours to complete, depending on your experience with this type of stuff. 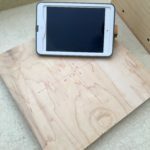 I planned my plywood cuts based on the idea that I want this prototype box to fit a few different sized tablets and phones; everything from a small 4.7” smartphone screen to a larger 12” iPad. With this in mind, the dimensions had to be at least 14-½” wide by at least 14-½” tall. This way, I could use the largest tablet size in both portrait and landscape orientations. You can tell from the dimensions written on the perimeter of this board that the height is 13-⅜”. 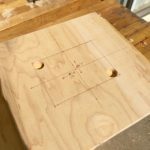 The top and bottom boards will be placed on top of the sides, creating an overall height of approximately 14-⅝”. (i.e., ⅝” top thickness + ⅝” bottom thickness = 1-¼”). 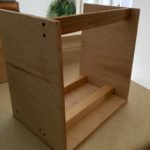 I planned to design the bottom depth of the prototype box at around 10”. This way, I can potentially add in side-mounted speakers or other electronics down the road (if desired) without worrying about whether the new stuff will interfere with the space needed for the tablet once the box is closed up. The sides are cut to the same specifications, whereas the top, bottom, back, and front pieces are cut to their own respective dimensions. 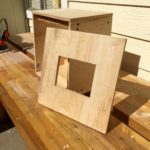 When building a semi-framed box like this, focus on getting the outside piece cut first. 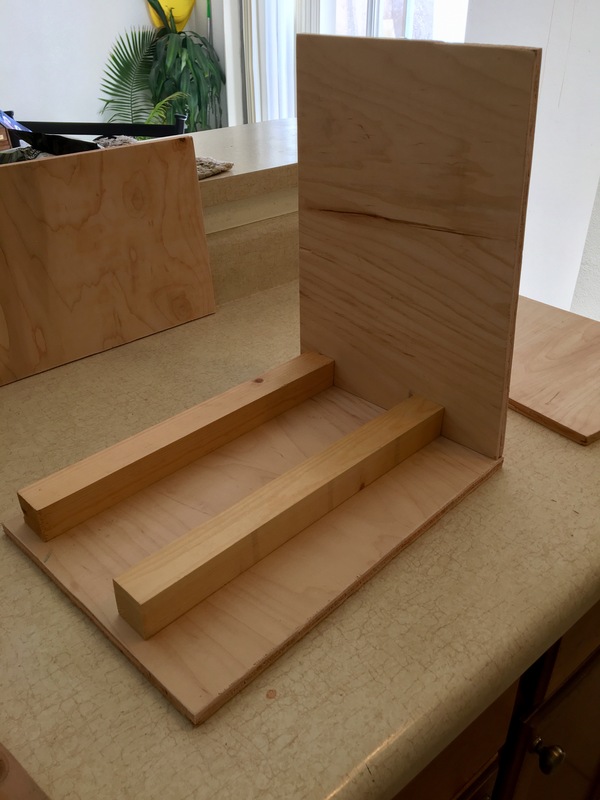 One reason for this is that you can temporarily clamp or screw two pieces together (e.g., sides) and cut everything at once, giving you the exact same cuts on both pieces. 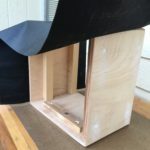 Another reason is that since the interior frame isn’t a completed box, it would be much more challenging to cut the plywood faces down to size once they were attached to anything else. Similar to the plywood pieces, I cut all the 1×2” down to size as well. 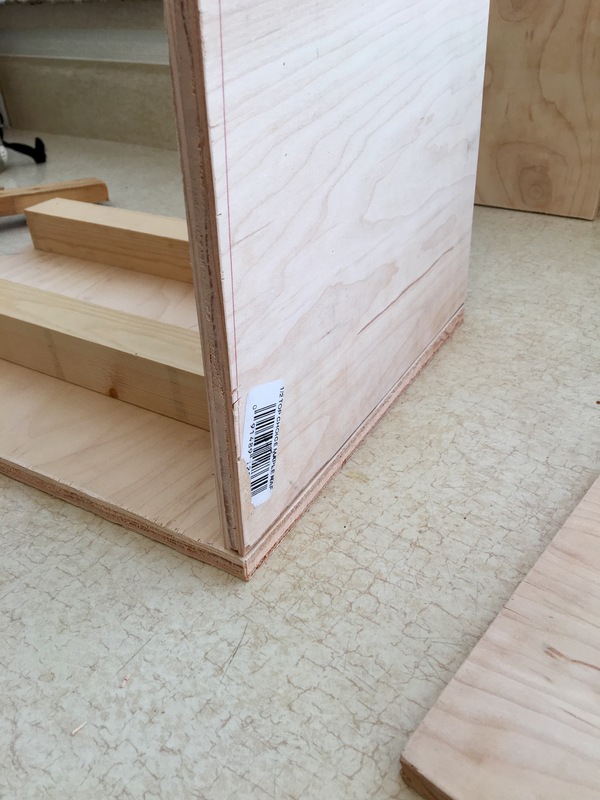 These boards sit on the interior of the prototype box, so there needs to be a lip of ⅝” on either side of it, once it’s mounted to the top and bottom plywood pieces. Since the box is 14-⅝” wide, that means these 1×2”s need to be cut to 13-⅜” wide. For this project, I had some 2×2” laying around as well that I incorporated here without much additional planning. For your project though, you could stick with 1×2”s and be fine; the thicker material doesn’t provide better (or worse) structural integrity. *Note: each screw you drive in through a plywood surface will need to have a countersunk hole. 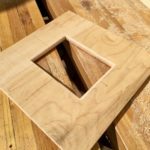 A countersunk hole is a hole where the screw head can sit beneath the plywood, so that it doesn’t sit proud of the plywood. 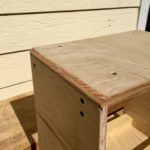 If you don’t countersink your screw holes, you will see and feel screw heads, even after you wrap your prototype box in tolex. 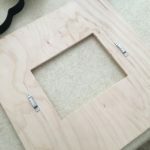 As a tip for this part: after getting your 1×2”s exactly where you want them, use a C or F-style clamp to hold the 1×2”s in place while you screw everything down with your 1” screws. 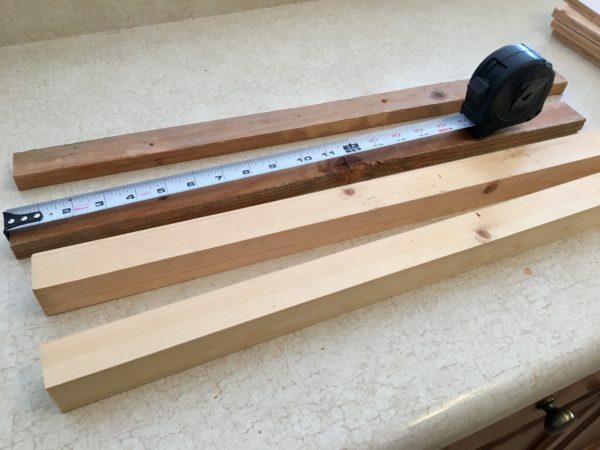 This will help you keep your pieces in better alignment during assembly, which in turn, makes later steps easier and keeps your measurements in check. 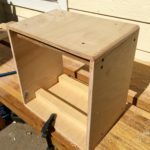 As an alternative to screws, you can also use a brad nailer too. 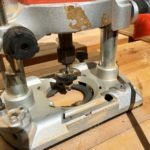 This is the type of tool that cabinet builders use because it allows you to tack things together easily and quickly with a mere squeeze of a trigger. Hold it in place with one hand, tack on a few brad nails with your gun. Simple. I would still go back through afterwards and put in a few screws to make things tight and secure though. 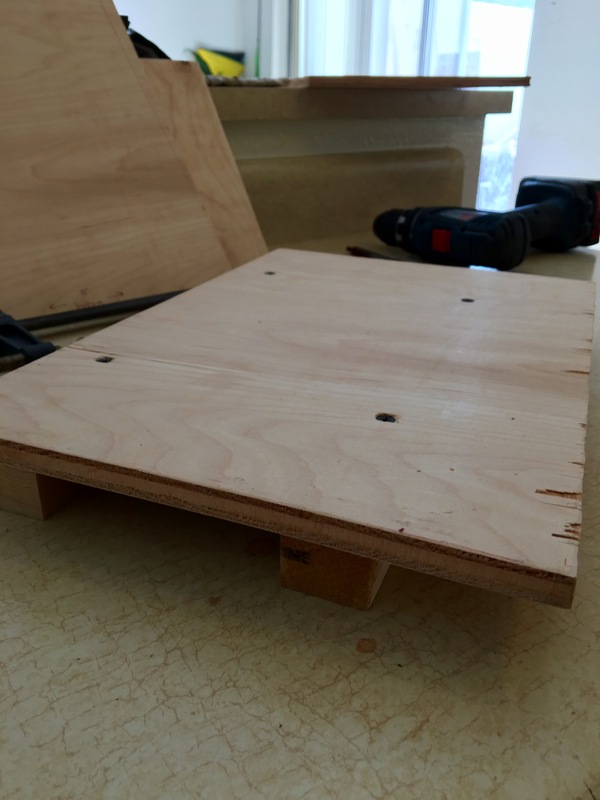 Flip the box back over, and attach the first plywood side of your prototype box with a screw or two into the 1×2”. In this image, you’ll see a couple red lines. This told me how much of an inside “lip” I would have once the front face was installed. 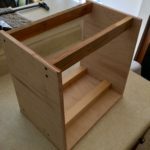 I designed the lip a little deeper than I’d like the final design to be because of the tolex that I’ll install in later steps. 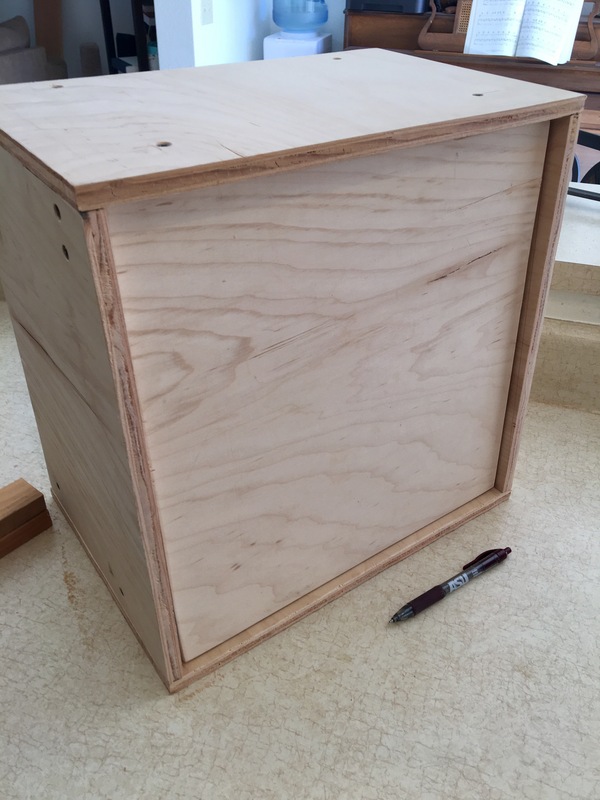 The tolex itself will add some thickness to the front face. In addition, wrapping the corners with tolex will add even more. I did a quick test fit on my front panel. It’s hard to tell in the pictures, but it was a little snug. 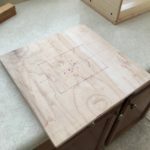 Normally in woodworking, this is a good thing. But for our purposes, we need a small (about ⅛”) gap around each of the four sides. 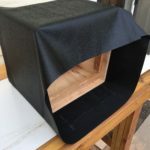 The reason for this is that once the tolex is wrapped around the box and the front panel, it will add additional thickness. 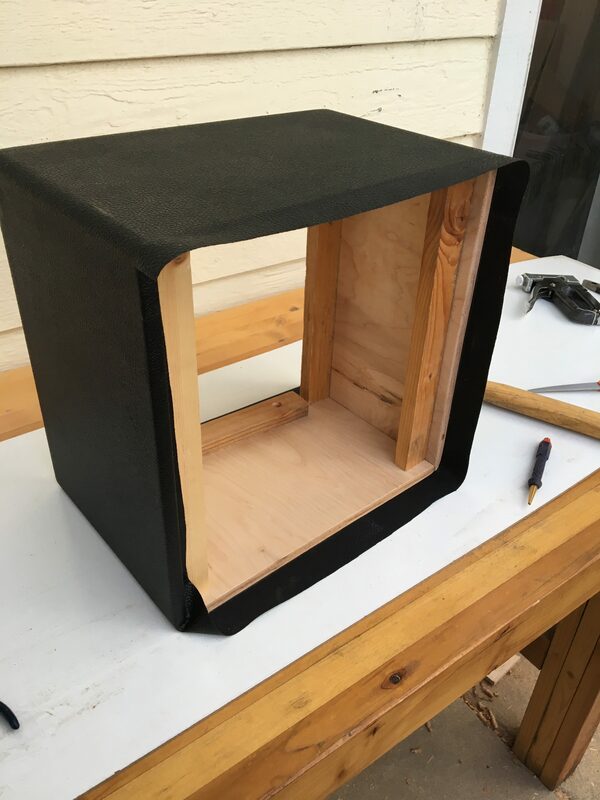 If your front panel is tight at this point, then it will be way too tight once the tolex is added. Side note: I would strongly suggest rounding over the edges of the screen opening. Sharp edges will make it harder for users to press items in the corners of the screen. It also makes the prototyping box look more “finished”. The tricky part is that you can’t do this in the same way that you will round-over the edges of the box later on. I used a rasp and sandpaper until I got the edge to match the ½” radius round-over pattern. 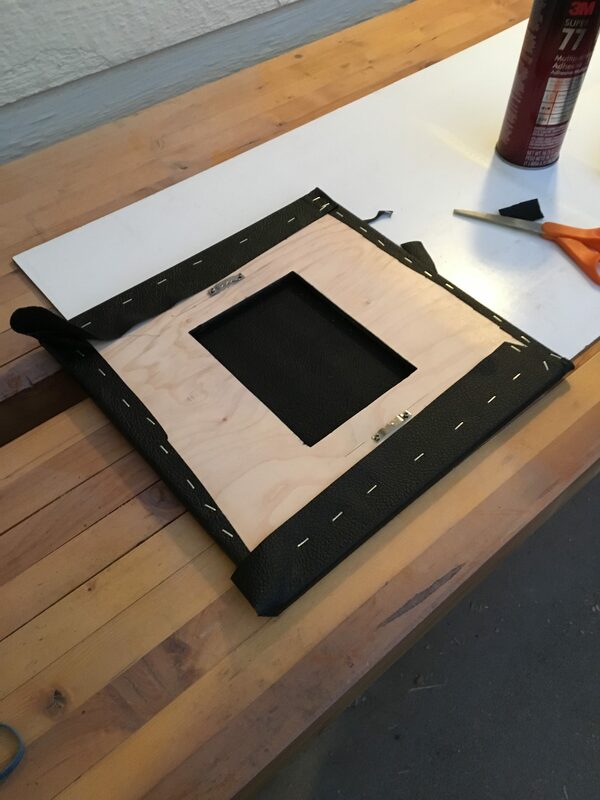 *Note: I didn’t take photos of this next step, but it’s necessary in order to mount the front panel to the prototyping box. You’ll need to install two 1×2”s along the inside edge of the box. They don’t have to be a specific length, or even the same length as one another. You just need something on the inside to give the front panel something to attach to with velcro (which, you’ll see in a later step). These 1×2”s should sit back inside the box to account for your box’s front “lip”. In other words, keep in mind how thick your front panel will be, then plan accordingly. *Note: I don’t have pictures of this next stage, but it’s still very important in order to achieve a smooth, professional look. 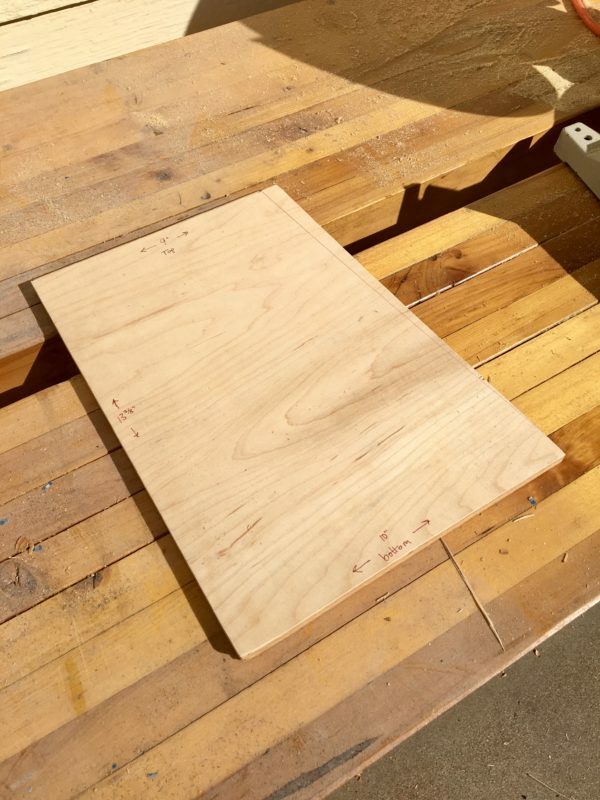 Before applying the tolex to the prototype box, be sure to fill in any screws, cracks, or voids in the plywood with wood filler. Let it dry for at least 12 hours. Then, sand everything flat. 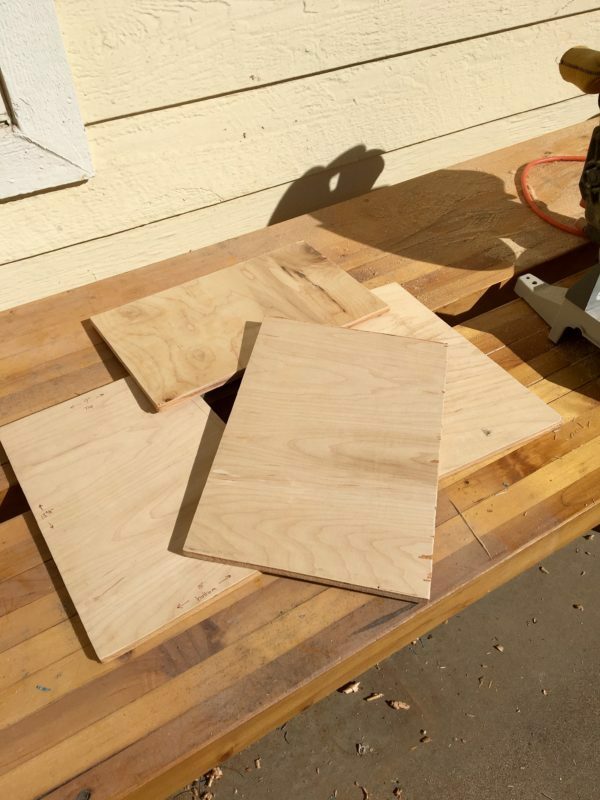 As you sand, keep an eye out for high spots, or chips in the plywood. If they are too big, they will show through after the tolex has been applied. Take care of these imperfections before proceeding to the next steps. 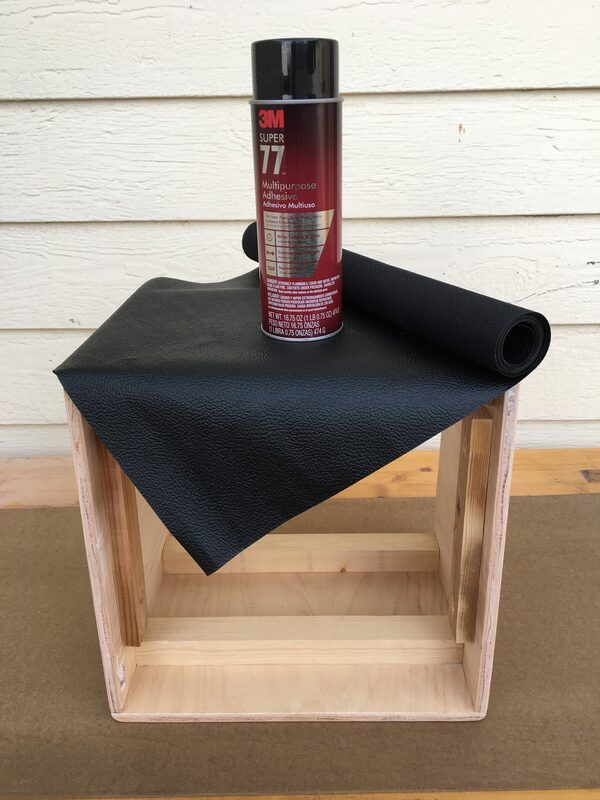 Start the tolex process by laying out some thin, disposable plastic painter’s drop cloths around any areas where you’ll work. The spray adhesive you’ll be working with in a moment gets everywhere. And yes, it has to be spray adhesive. I’ve tried squeeze bottle adhesives, brushed on adhesives, and rolled on adhesives. They don’t work well, evenly, or easily. Spray adhesive is faster, easier to work with, and is re-workable for a few minutes after spraying. Side note: make sure that the spray adhesive you’re using will bond with both plastic and wood. 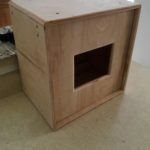 I used the 3M 77 multipurpose spray adhesive on this project (and others) with good results. Just be sure to store the can in a room-temperature environment afterwards — otherwise, the material in the can will quickly degrade and be unuseable. Once your area is covered up well, flip the prototype box over, and spray the bottom surface with your adhesive. Be sure to get the edges and corners of the prototype box well too. 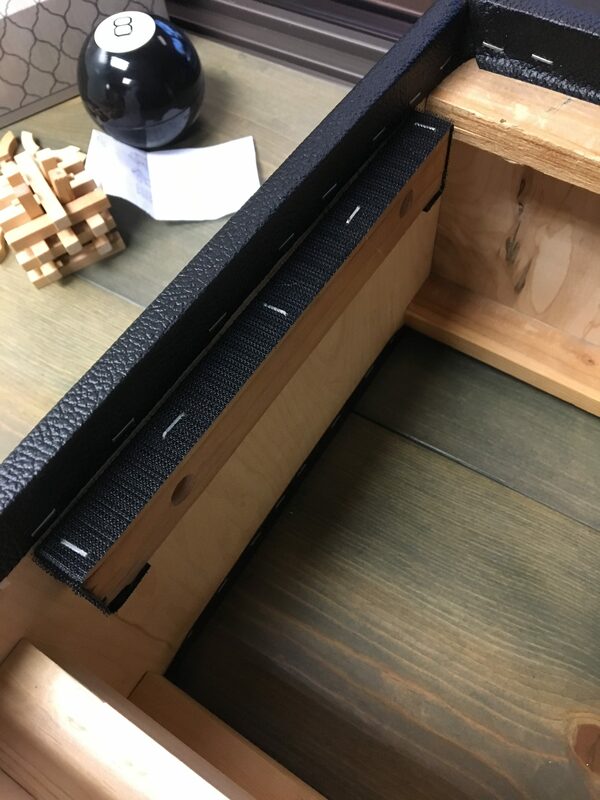 Line up your first tolex seam about 1” inside the left or right side of the box. 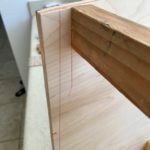 You don’t want your final seam to be right on the radius of your corner, otherwise it will eventually come apart from wear and tear. Plus, you’re more likely to see the seam if it’s on the corner (especially if you don’t end up with a crisp, final cut). 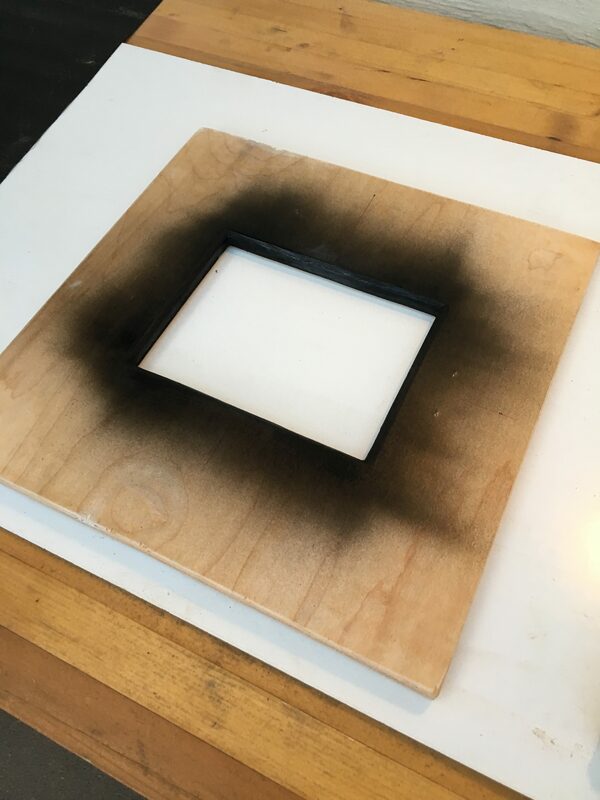 After rotating the box and unrolling the tolex simultaneously, spray the next surface on the box with your spray adhesive. Repeat this process until all four sides have been sprayed and rolled out. Be sure to work out any air bubbles or wrinkles as you go. 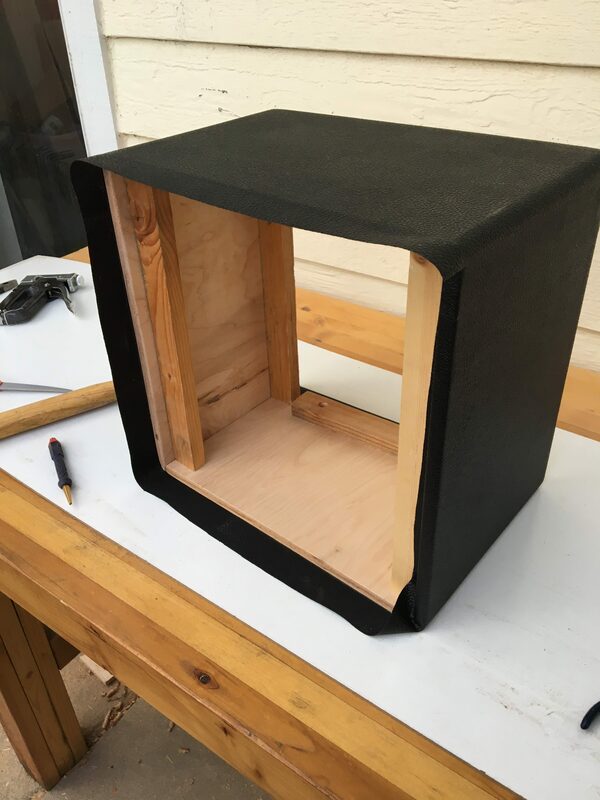 You shouldn’t need to “pull” the tolex to make it tight. The weight of the tolex and smoothing it out with your hand should be more than enough to make it nice and flat. Also, don’t worry about wrapping the inside edges yet. As long as you work somewhat quickly and wrap the four sides within a few minutes, the adhesive will still be “open” (i.e., workable). Begin stapling. I like pull the tolex flat as I staple, moving inch by inch, so that I know it’s flat, smooth, and even. Again, be sure that your staples won’t be visible after the front panel has been inserted into the prototype box. You may need to spray a little more adhesive on the edges if you didn’t work quick enough. No big deal. Be careful to over spraying adhesive on the tolex you’ve already laid out though. If you do get adhesive on it, use GooGone or some other similar adhesive remover to clean it up. The corners will be tricky at first. You’ll need your craftsman’s knife here. Figure out a pattern or look that you are comfortable with. Personally, I prefer to do a single fold in the corners, rather than having it “pucker” with a couple smaller folds. 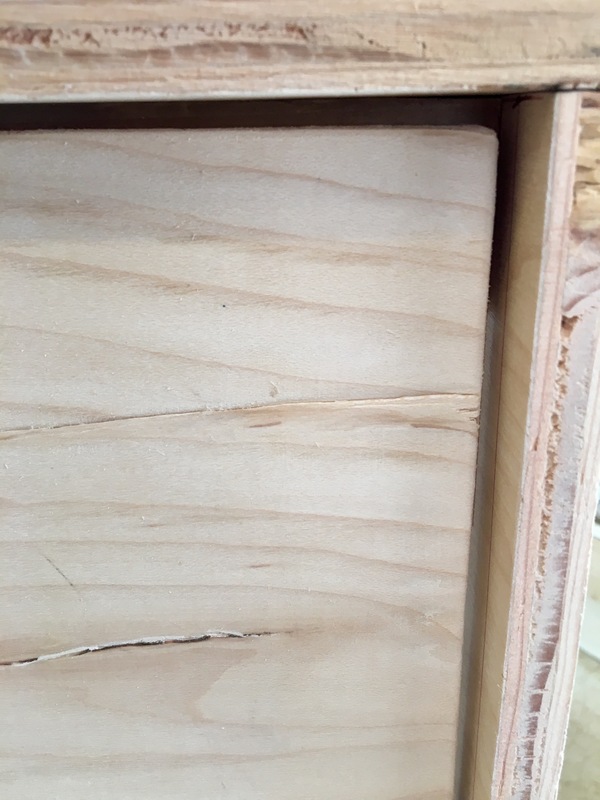 To get the fold correct, you’ll need to cut the tolex in the inside corner. 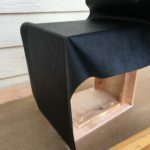 This allows you to fold over one edge and get a nice, finished looking seam. Next, glue, wrap, and staple along the front panel’s outer perimeter. Remember, it doesn’t have to be pretty on the back side of the front panel. Nobody will ever see it (unless you write a blog post about it — then a lot of people will see it). Then, cut out your screen opening and staple that back as well. 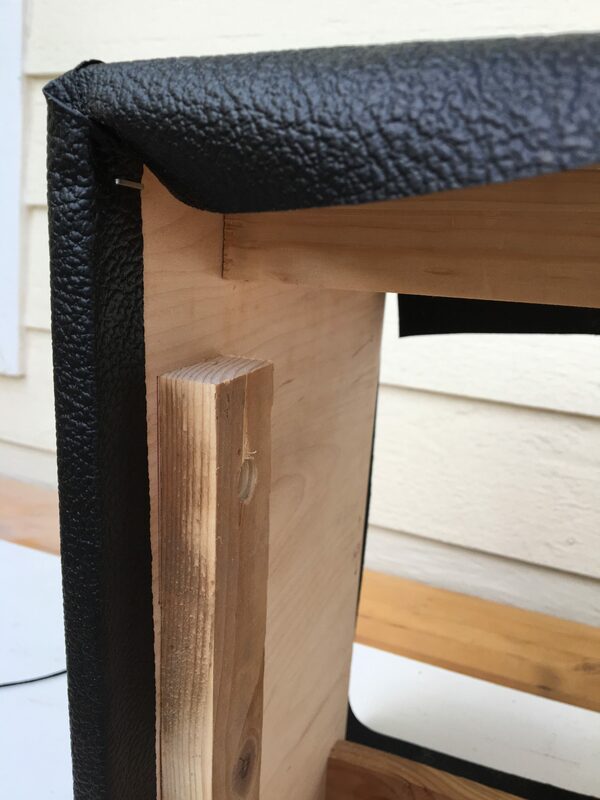 Don’t cut out the opening too close to the edges either — like your perimeters, you need to account for your roundover and stapling the tolex down as well. One of the final steps is wrapping the 1×2”s on the inside of the prototyping box with (non-stretch) velcro. Staple it down securely. From past experience, you need to wrap the velcro around the back edge of the 1×2”, not just the front of it. Otherwise, it will come up over time. I like to use the soft, “loop” side of the velcro for this part. There you have it. 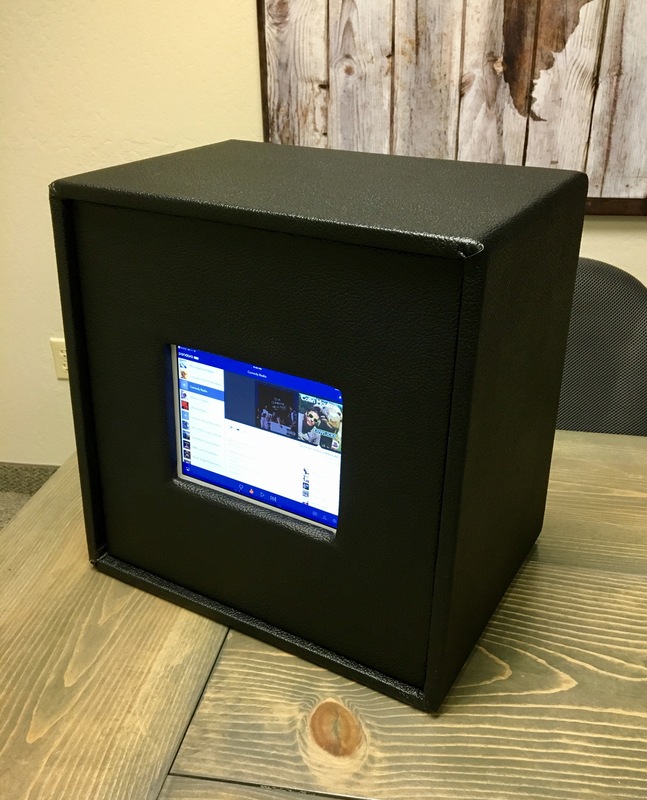 Your prototype box is now complete and ready for testing. 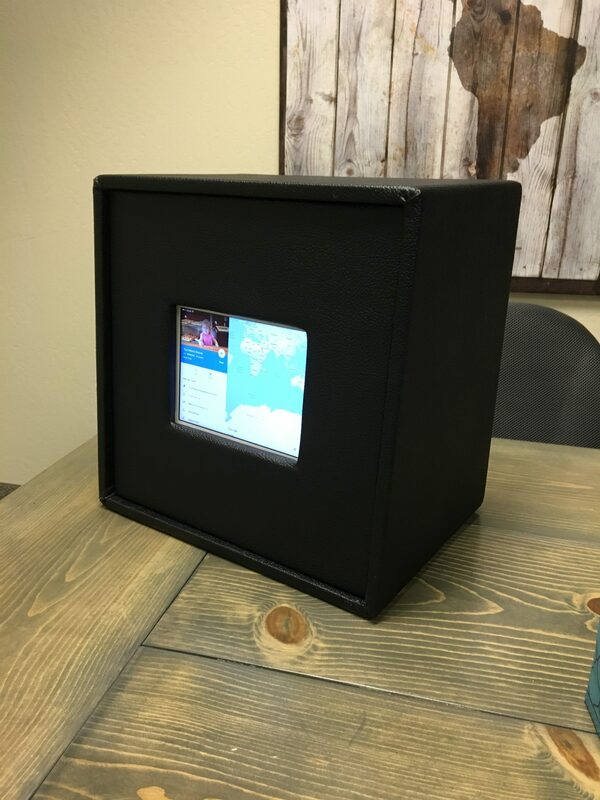 If you install additional velcro on the back-side of your front panel (i.e., on all four sides), you can also rotate your prototype screen from landscape (shown above) to portrait. Additionally, you could make a couple different sized front panels to accommodate for different sized tablets. If you plan to do this — and I highly suggest you do! 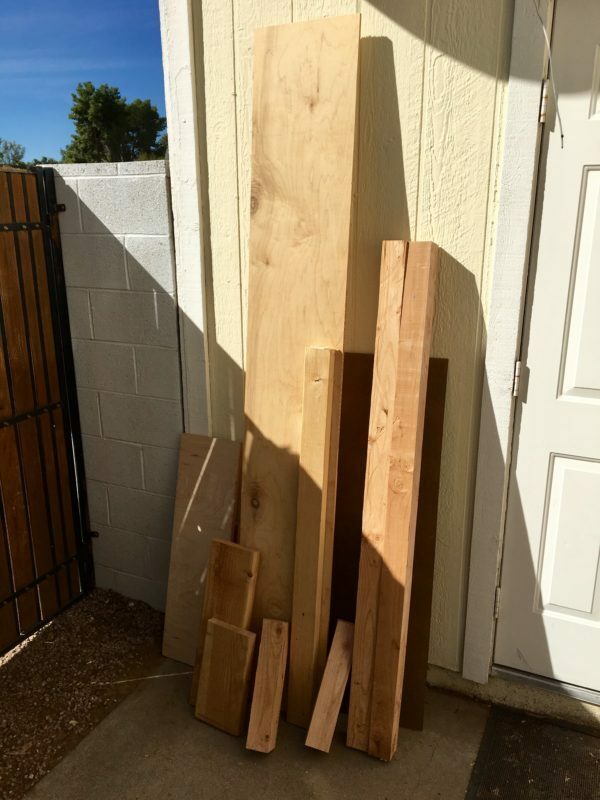 — remember to purchase additional plywood and tolex as well.